Since Renton's arrival, Eureka's relationship with the Nirvash has been changing. More mysteries await, however, as the Gekko has discovered a mysterious phenomenon called a Coralian. Although she's not really up to the task, Eureka goes out in the Nirvash and flies inside. Once inside, she is attacked by a new LFO. Renton, meanwhile, has fallen unconscious, and has a dream about Eureka and the girl she's fighting. But is it really just a dream, or is he somehow connected to Eureka and the Nirvash in this state? Meanwhile, the Gekko has come under fire by the Federation warship Izumo, and the members of Gekkostate will have their hands full escaping from both the warship and the Coralian, especially without the Nirvash to assist them. 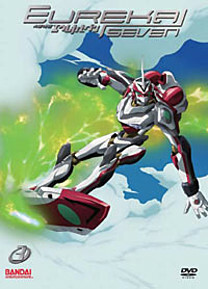 DVD Features: Commentary for Episode 13, Voice Actor Interviews.